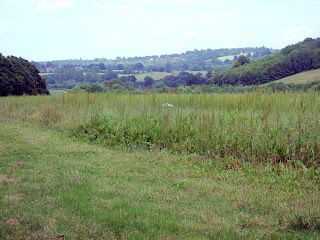 We walked around Hurst Green (just over the border in Sussex) yesterday. The world is so lush and green right now! 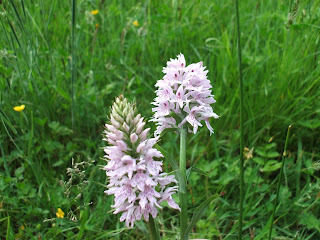 I thought the highlight was going to be a patch of stunning wild orchids. 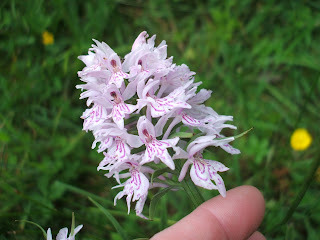 I've left my finger in the shot so you can see their delicate size. Later though, we saw a pair of buzzards (not that common down south) circling hig above and calling to each other. I did my best Ray Mears impression and called back to them, and I'm sure they answered. Husband not quite so convinced! And later still - husband was in front and stopped dead, signalling to me. Sadly i thought he was telling me to stop - he actually wanted me to catch up! There in front of him were three little fox cubs playing in a clearing. By the time I got there I just saw the last one chasing his brothers. He barked at them to wait for him! We'd never heard a fox barking before. I suppse we walked for 2 or 3 hours - didn't see a human soul in all that time. Bliss! beautiful photos. thanks for posting.